CAPE TOWN, South Africa, February 1, 2017 (ENS) – Safari Club International, America’s most powerful hunting lobby group, this week will auction the lives of 280 South African animals to raise funds to lobby the Trump administration against measures protecting threatened species, such as the Big Five: elephant, rhino, lion, buffalo and leopard. At a trophy hunting convention the Safari Club International is hosting in Las Vegas February 1-4, the hunting lobby group expects an estimated 25,000 hunters to bid on at least 60 South African hunting trips. 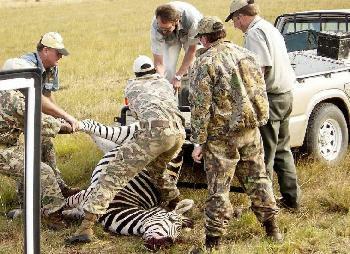 American hunters are being offered the chance to kill all of South Africa’s iconic species. Successful bidders will be able to shoot giraffe, hippo, zebra, baboon, wildebeest, sable antelope, warthog, greater kudu, impala, springbok, blesbok, caracal, African wildcat, with 119 other animals proffered as “upgrades” for an additional cost. The South Africa hunts are valued at US$1.01 million (about R13.57 million), from an estimated total of US$5.3 million from other hunts on auction. 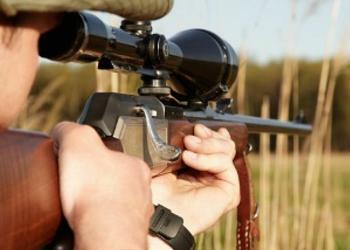 These include the hunting of some 1,000 mammals internationally, including imperiled polar bears. All profits from the trophy hunts will go directly toward funding SCI to actively lobby the U.S. government towards a pro-hunting stance. The group will hope to wield considerable influence on the Trump administration, especially the Department of the Interior, which manages natural resources. Based in Tucson, Arizona, SCI filed a lawsuit against the U.S. Fish and Wildlife Service in January defending the practice of aerial hunting and other inhumane predator-killing practices in natural refuges in Alaska. The group financially supports U.S. political action committees (PACs) like the Hunter Defense Fund, which actively works to elect pro-trophy hunting politicians to Congress. According to Safari Club International, 94 percent of SCI-supported candidates won in the 2014 U.S. Congressional election and 147 pro-hunting candidates have been elected to Congress. With the new administration under President Donald Trump, SCI’s influence is set to increase even further. “We are worried that with the new U.S. administration in power, pro-trophy hunting advocacy groups like SCI will have undue negative influence on key wildlife conservation issues,” says Masha Kalinina, international trade policy specialist at the Wildlife Department of Humane Society International. President Trump’s sons, Donald Jr. and Eric, are both trophy hunters and images of their African safari kills have angered conservationists and wildlife lovers. SCI also influences U.S. government policies toward several African nations. In 2010, SCI forced Namibia to reverse its ban on leopard and cheetah hunting. A similar scenario occurred in Zambia when the powerful lobby group persuaded the Zambian government to reverse its ban on hunting lions and leopards. In September 2015, SCI and other pro-hunting organizations met behind closed doors with the South African Department of Environmental Affairs and representatives of other African nations in Polokwane to discuss the “benefits” of trophy hunting. Journalists and non-hunting conservation groups were barred from the meeting, which generated suspicion as to the exact nature of SCI’s involvement with the Department of Environmental Affairs. This week, as part of the online auctions, there will be two South Africa hunts valued at US$16,500 (about R223,000) and US$15,000 each – from Thaba Mmoyo Safaris and Melody Safaris – that offer to hunt wildlife with dogs. This controversial practice, known as “hounding,” sets dogs upon a wild animal, which is chased until exhausted, trapped, and easily shot. These auctions can be seen here and here. “It’s time to bust the myth that killing for kicks helps conservation in any significant way at all, it simply doesn’t,” explains Kalinina. Humane Society International is calling on South African citizens to oppose the callous killing of wildlife for entertainment by signing a pledge to end trophy hunting.